Russian President Vladimir Putin and Prime Minister Dmitry Medvedev have sent their condolences to the Venezuelan people over President Hugo Chavez's death and expressed their hopes that Russia and Venezuela will continue to strengthen their bilateral relations. Russian President Vladimir Putin has sent his condolences to the Venezuelan people over President Hugo Chavez's death and says he is convinced that Russia and Venezuela should continue to strengthen their bilateral relations, the Kremlin press service reported on Wednesday. Putin addressed his "sincere condolences" to Venezuelan Vice President Nicolas Maduro and all Venezuelan people, calling Chavez "an outstanding leader and manager and Russia's close friend." "Vladimir Putin highly praised the Venezuelan leader's personal efforts that helped lay a solid foundation of Russian-Venezuelan partnership, arrange active political contacts and launch far-reaching humanitarian and economic projects and expressed his conviction of the need to further follow this way, strengthening and developing the relationship between Russia and Venezuela," it said. Putin, who met with Chavez on numerous occasions, mentioned his qualities. "This was an extraordinary and strong man who looked to the future and always set the highest possible standard for himself," he said. "The Russian president emphasized that fortitude and vital energy typical for Venezuelans will help them overcome the tribulations that have befallen them and continue the noble cause of creating a strong, independent and prospering Bolivarian Republic of Venezuela," the Kremlin press service said. In addition, Putin has endorsed the composition of a Russian official delegation to travel to Venezuela to attend President Hugo Chavez's funeral, Peskov added. "At Russian President Vladimir Putin's decision, Russia will be represented at Venezuelan President Hugo Chavez's funeral by Igor Sechin as Russian presidential special envoy, Denis Manturov as a co-chairman of the bilateral intergovernmental commission, and Sergei Chemezov." Meanwhile, Russian Prime Minister Dmitry Medvedev has conveyed his condolences over Chavez's death as well. In a telegram to Maduro, Medvedev expressed his sincere condolences on behalf of the Russian government and on his personal behalf on the death of "Comandante Hugo Chavez, an outstanding politician and statesman and a great friend of Russia." "All Chavez's life is an example of selfless service to the Venezuelan people and fight for justice and equality. We share the pain of your loss and will always remember this remarkable man, patriot and citizen," Medvedev said. The Russian premier suggested that it is hard to overestimate Chavez's personal contribution to strengthening Russian-Venezuelan partnership. "It is in large part owing to his energy and purposefulness that major joint projects in the energy, industry, high technology, transport infrastructure, agriculture and other sectors are being pursued," he said. "I am sure that further development of bilateral cooperation fully meets Russia's and Venezuela's fundamental interests," Medvedev said. He asked Maduro to convey his words of sympathy and support to Chavez's relatives and beloved ones. Meanwhile, a book of condolences has been opened at the Venezuelan Embassy in Moscow over the death of Venezuelan President Hugo Chavez. "The book of condolences is open today and tomorrow from 9:00 a.m. until 5:00 p.m.," the Venezuelan Embassy told Interfax. 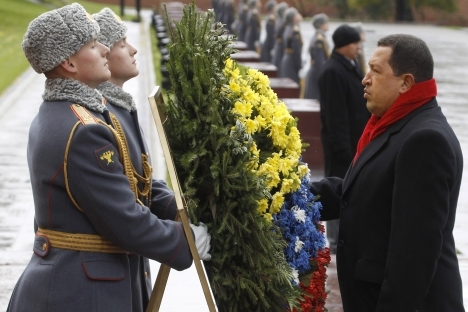 Foreign Minister Sergei Lavrov has also presented Russian condolences over the death of Chavez. "On behalf of the Russian administration and personally President Vladimir Vladimirovich Putin, allow me to present profound condolences over the death of Venezuelan President Hugo Chavez - a great son of his people and Latin America, an outstanding contemporary statesman and a big friend of our country," Lavrov wrote in the book of condolence. The minister said he was confident that the people of Venezuela "would defend the achievements of the Bolivarian Revolution" in the time of ordeal. "Russia is with you!" Lavrov stressed. Chavez died at 4:25 p.m. local time (12:55 a.m. Moscow time) on Tuesday. In December 2012, he underwent surgery for cancer in Cuba, which later caused complications.